In an alley somewhere, an old man hears a cat meowing. He enters the alley to look for the cat, but is instead met by a couple of punks. One of the punks begins beating the old man senseless with a baseball bat, forcing the man to shoot him in the stomach with a concealed gun. The other punk runs away in terror. The next day, at another part of town, the Turtles are observing a meeting of gang members. Suddenly, to their shock, Nobody appears and approaches one of the hoods. The hoods pull out their guns and open fire. Nobody flees and the Turtles circle around to meet him. Having lost the punks, Nobody asks the TMNT for their help. The old man involved in the shooting last night happened to be a friend of Nobody’s. And although the punk he shot will recover just fine, his fellow gang members want to kill the old man for shooting one of their own. Nobody wants to make sure that doesn’t happen. That night, at the old man’s apartment, he and his wife, Eugena, are watching Jeopardy. Suddenly, several members of the gang kick the door in, swearing to kill the old man for what he did to Jacky (the punk). However, the “old man” and the “old lady” turn out to be Mike and Raph in disguise. They beat the punks senseless, sending one crashing through the window in horror. He tries to escape through the alley but is beaten by Nobody. Later, the Turtles regroup with Nobody on the roof. Nobody is pleased with the results of their ruse, content that the punks will leave the old couple alone out of fear of them being “aliens” or something. Raph asks what will happen to the old man and Nobody says that, considering the circumstances, he’ll likely get off with probation. The Turtles and Nobody then declare the case “over” and go their separate ways. Elsewhere, at a gun shop, a different old man asks to buy a .44 Magnum and the cycle of violence is doomed to continue. 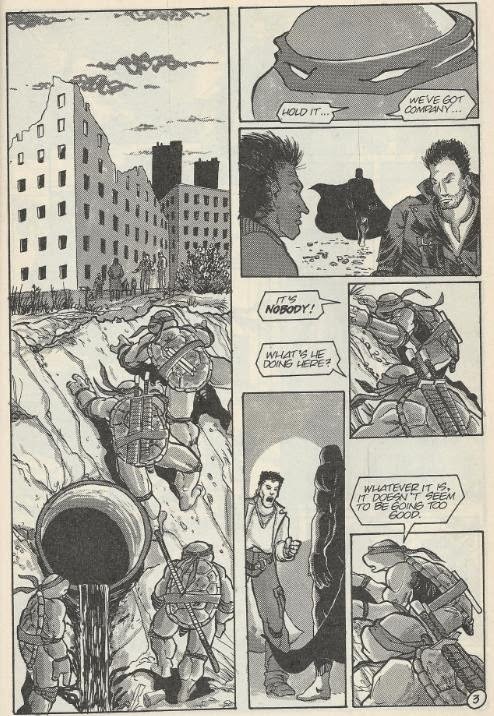 *Nobody previously encountered the Turtles in Tales of the TMNT (Vol. 1) #2. 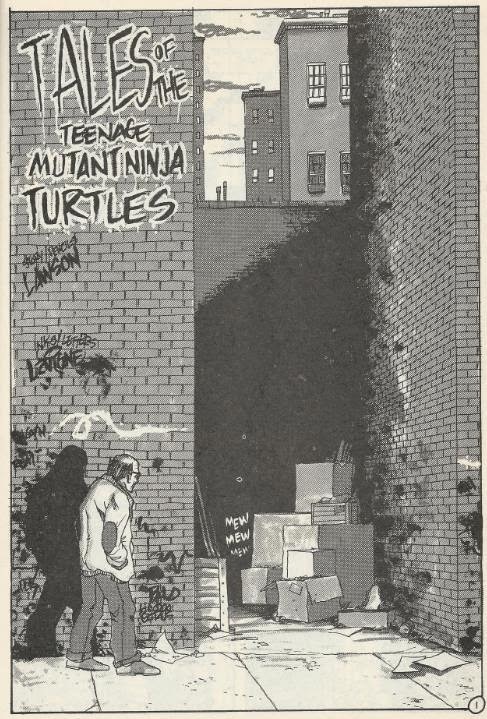 He’ll meet them again in TMNT (Vol. 1) #48. *So far as timeline placement is concerned, I personally stick it in the “Exile to Northampton” era some time before TMNT (Vol. 1) #19. *This story was partially adapted for the 2003 TMNT cartoon series for the episode “Still Nobody”. *Incidentally, when this story was reprinted by IDW for TMNT Ultimate Collection Volume 6, it was given the title "Untitled Nobody Story". That uppercase "S" in "Story" makes it a proper noun! 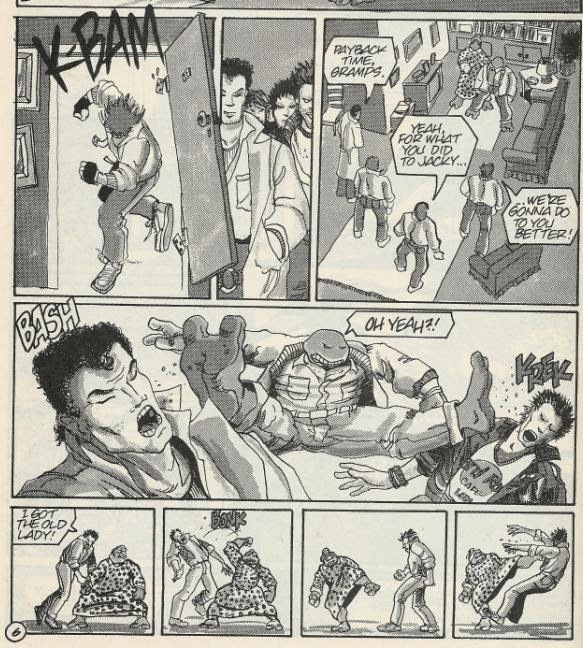 You know, there are honestly a truck-load of these short TMNT stories published as back-up content in various reprints of issues, or as bonus items in trade collections or even as guest strips in other comic books. It would be a godsend if Mirage would publish an omnibus collection of all these miscellaneous odds and ends. “Shell Shock” is by far the most comprehensive collection of these shorts, but still falls far from featuring them all. Some stories, like this untitled Nobody tale, have never been reprinted anywhere. And with the 1989 edition of the Tales of the TMNT (Vol. 1) trade paperback being excruciatingly hard to find, and nightmarishly costly, a lot of folks won’t get the chance to read it. Personally, I had to beg for scans of it off a message board because I had no other alternative. Thankfully, if the TMNT fandom is anything, it’s generous, and I was met with scans fairly quickly. A lot of these TMNT shorts are pretty forgettable, typically comedy relief pieces or just some meaningless actiony filler and nothing more. A few, however, are worth noting, such as the first “Complete Carnage an' Radical” story or, yeah, this untitled Nobody piece. 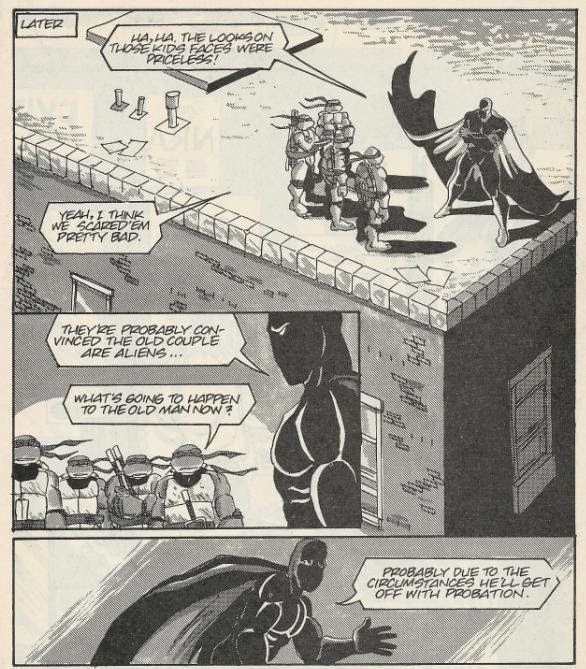 Nobody was always an interesting character who just never got to appear enough in the comic, showing up in only three issues before being unceremoniously killed off in TMNT (Vol. 2) #12. While this story doesn’t offer much in its 10 pages, mostly acting as just an excuse to get Mike and Raph to dress up like old people, it’s still fun to see Nobody in action, however little action that might be. With the year being 1989, Jim Lawson is still at the top of his game in the art department. While it still screams “back-up strip”, it’s got a nice, gritty texture to it (thanks, I’m sure, to Steve Lavigne’s inks) and some great back-grounds and environments. The story is a thinly veiled public service announcement about the cycle of violence caused by guns, though the moral is a bit confusing and no solution is offered. The old man used his gun only in self-defense, after the punk had begun to beat him with a bat. The punk who got shot, “Jacky”, apparently survived the wound, too. So, at first glance, the story seems to be encouraging the ownership of guns so long as you only use them in the most dire of life-or-death situations. Yet the act of shooting the punk incites retribution from his gangbanger friends, which is only resolved through further use of fear and violence by the TMNT and Nobody. And even after all that’s settled, another old man is shown buying a gun, implying that the whole thing is doomed to start all over again. Yeah, I’m just as confused about the point as you are. Overall, it’s a nicely drawn story, featuring an underused supporting character, but fumbles the ball at the finish line thanks to an ill-defined objective. Regardless, it’s still one of the better TMNT back-up shorts, though not worth paying most of the ridiculous asking prices the 1989 Tales of the TMNT (Vol. 1) collection goes for. Is it a different old man at the end of the story? I always took it to be the same old man, since he is wearing the same outfit as the old man in the first panel. If it is the same old man then it just furthers the escalation message of the whole piece, because even though all is said and done the man is now upgrading from his .22 to a .44 which would probably have been the difference between "Jacky" living or dying if the situation were to happen again.